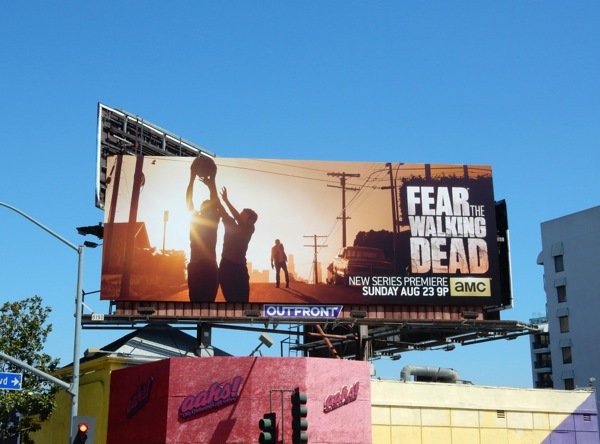 Just when you thought it was safe to turn on your TV sets this Summer, along comes the onset of the zombie apocalypse with Fear the Walking Dead. 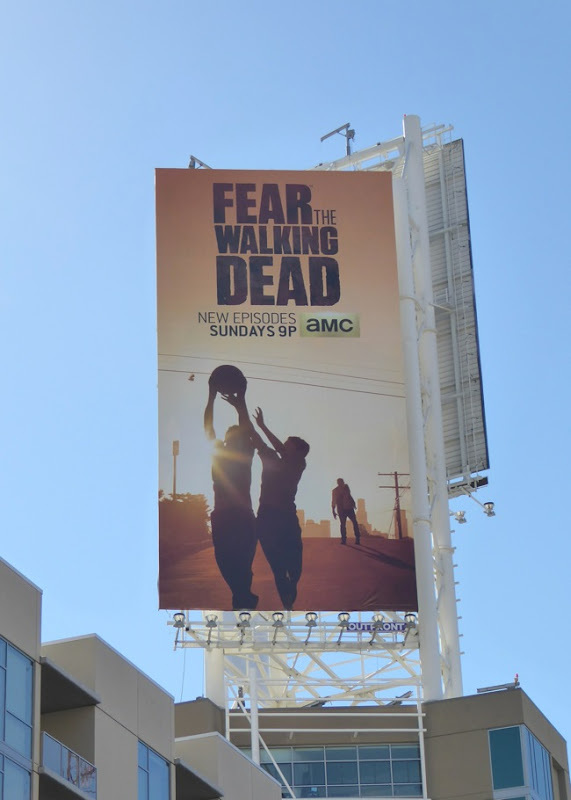 There's no wonder that AMC's new companion series to their ratings winner wanted to keep The Walking Dead in the title somehow, as you instantly know what universe the spinoff inhabits. 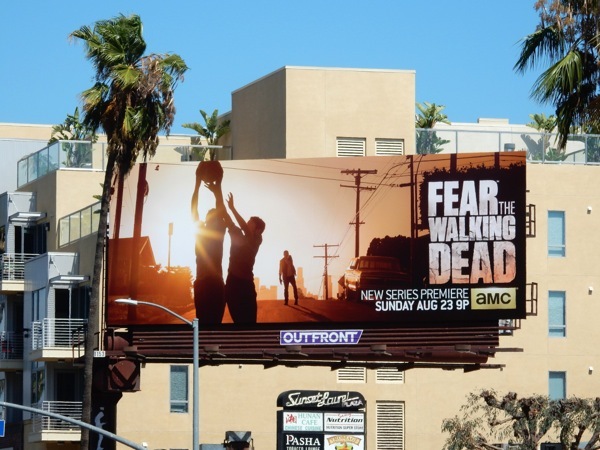 The main difference here is that this show will explore the beginnings of the zombie epidemic, or to put it another way, all those month that 'Rick Grimes' was unconscious in the hospital. 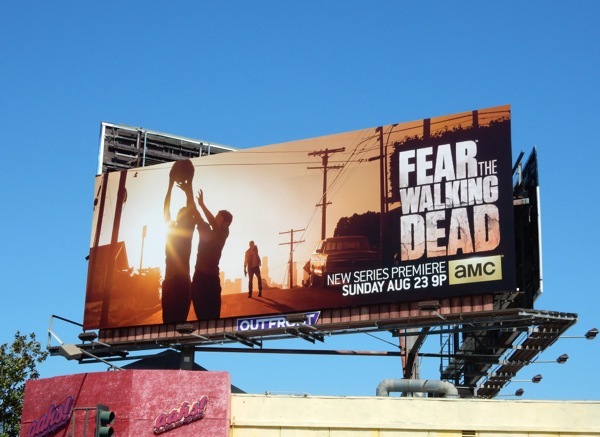 Another departure is that Fear the Walking Dead will take place in Los Angeles, and these billboards feel very at home in the skies of L.A. with the ad creative featuring two kids playing basketball as the sun rises over Downtown, unaware as a zombie ambles towards them up the street. The main characters in this unfolding nightmare will be a widowed guidance counselor, 'Madison' (Kim Dickens), and school teacher 'Travis' (Cliff Curtis), whose relationship status is already complicated as they both have children from previous marriages, two for her, one for him. As if family drama wasn't bad enough, they now have the dawn of an undead apocalypse and flesh-eating walkers to contend with. 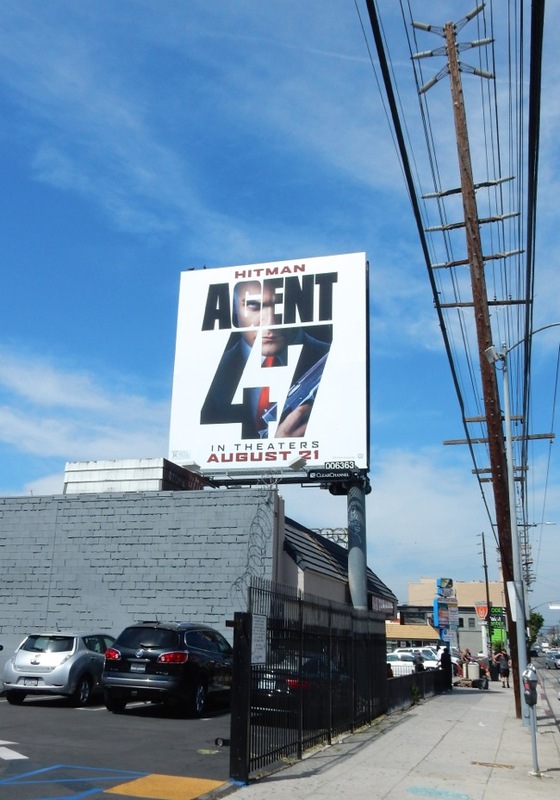 These ominous series premiere billboards are just perfect for the new series and were snapped along Sunset Boulevard on July 29, 2015. 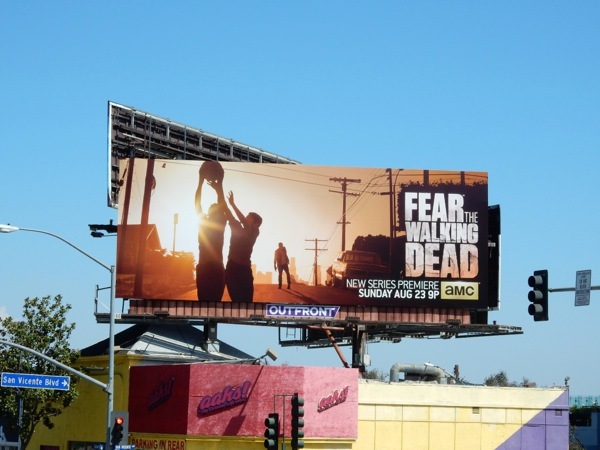 If you're a fan of the parent show, be sure to also check out all these previous season billboards for The Walking Dead. 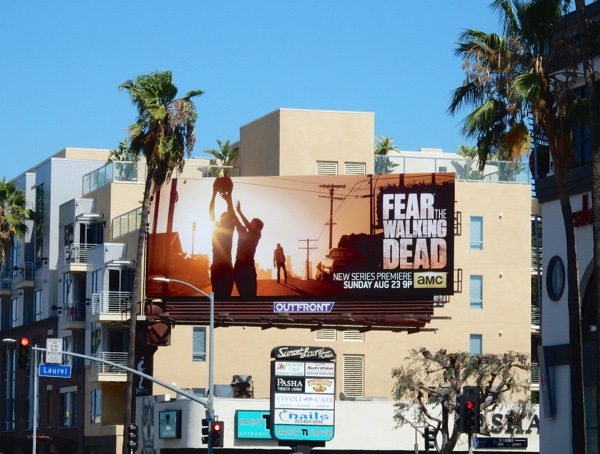 Normally Daily Billboard would say that you don't always need to be shown in intimate detail the origins of an event, but this series will no doubt answer many questions that fans have about the early days of the zombie plague and the downfall of humanity. 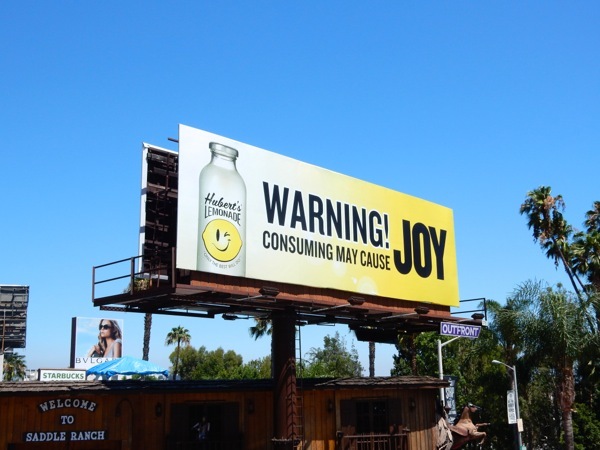 Plus from the sounds of things it will be told through the perspective of a very different group of people in another city (famous for its multitude of billboards), and that should make the dynamic as equally exciting as the original. 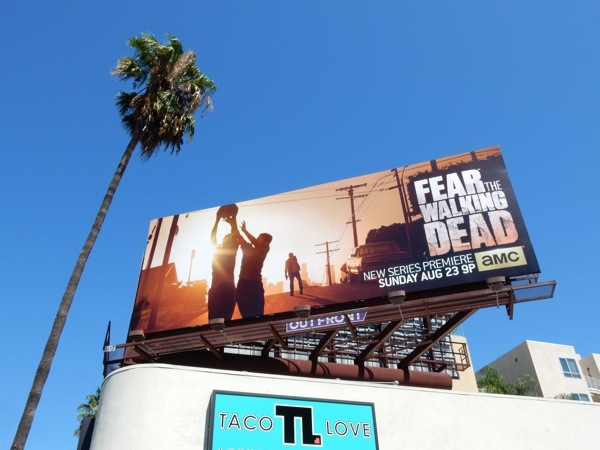 UPDATED: Now that the first gripping short season of Fear the Walking Dead is over, here's another portrait format billboard of the series launch billboard spied high over Vine Street in Hollywood on October 9, 2015. 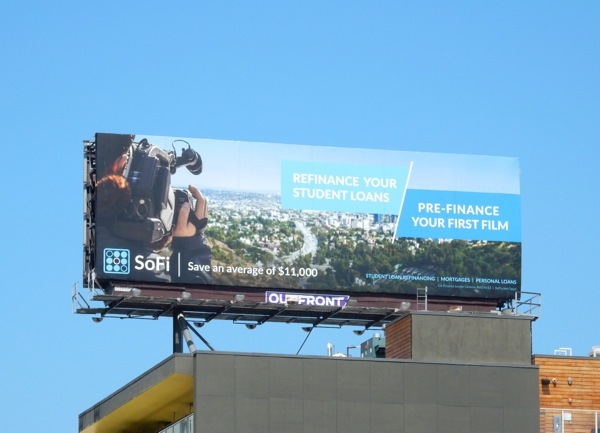 Finance can be a a dull and boring subject matter in advertising at times, especially if you're a person who's not flush with cash, but these SoFi billboards caught Daily Billboard's magpie eye recently. 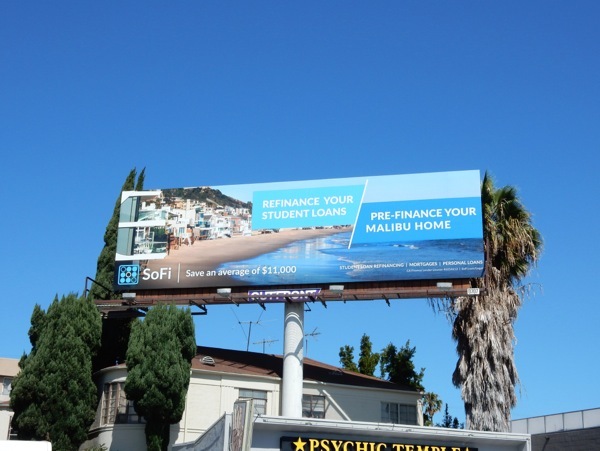 The simple design works with multiple images and the ads are locally tailored to living in Los Angeles, where you can see the appeal of re-financing your student loans to finance your first film or business venture, or get a step up on the property ladder (that will ultimately lead to your Malibu beachfront home). 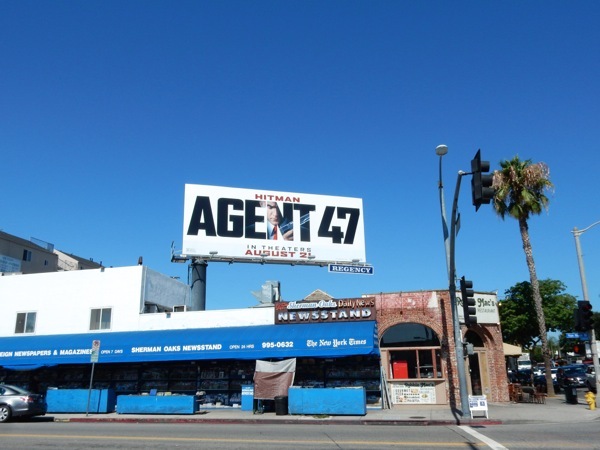 L.A. may be known as the City of Angels, but it's also the city of dreams, where everyone is working one job, but at the same time is writing a script, or making a podcast, or developing a TV pilot, or investing in a revolutionary new startup project. 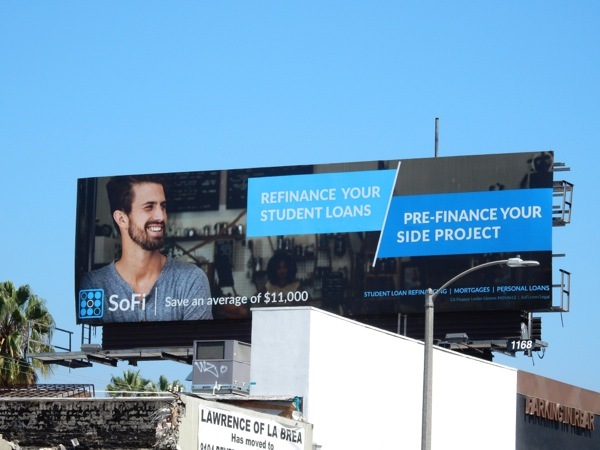 Who wouldn't want to snap up the opportunity to refinance their student loans and pre-finance their dreams? 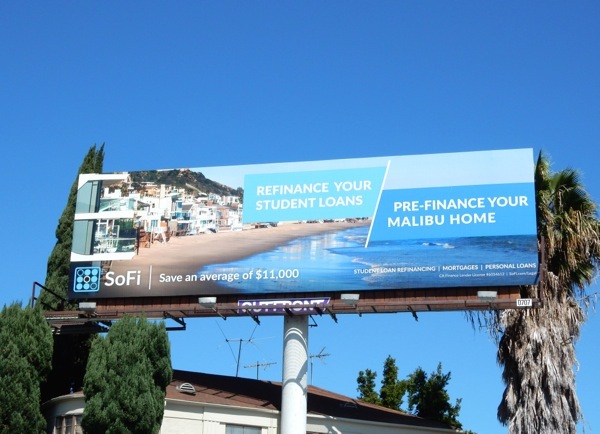 The 'Malibu home' SoFi ad creative was spied along La Cienega Boulevard on July 10, whilst the 'first film' version overlooking Downtown L.A. was snapped high over Wilshire Boulevard the next day and the 'side project' billboard was photographed along La Brea Avenue on July 24, 2015. 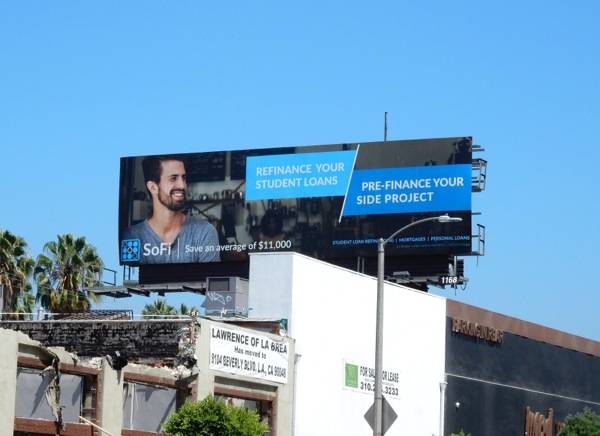 For more examples from the world of finance, money lending and credit cards, be sure to check out these financial outdoor ad campaigns from recent years in the skies of L.A.
Now if only Daily Billboard still had some student loans to refinance, just think of the possibilities. 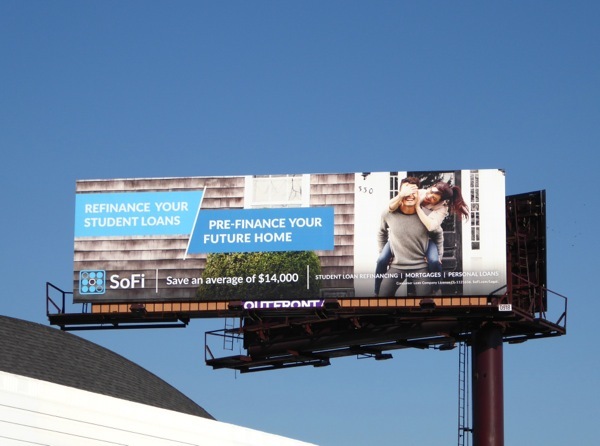 UPDATED: SoFi is back with another wave of creatives (and some repeats in new locations), just in time for gift-giving season when money may be tight. 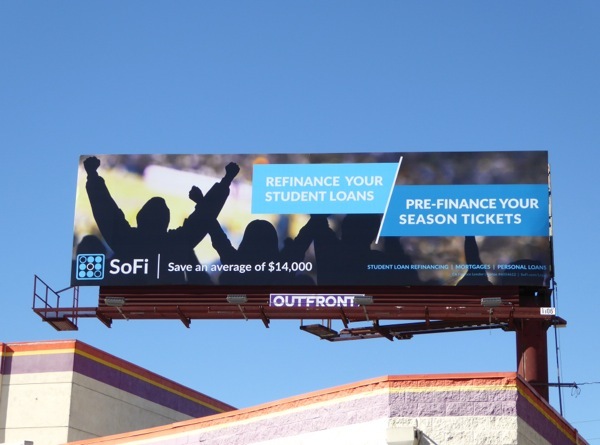 The 'Pre-finance your future home' billboard was snapped above Pico Boulevard, whilst the 'Pre-finance your season tickets' was spotted along Santa Monica Boulevard on November 5, 2015. 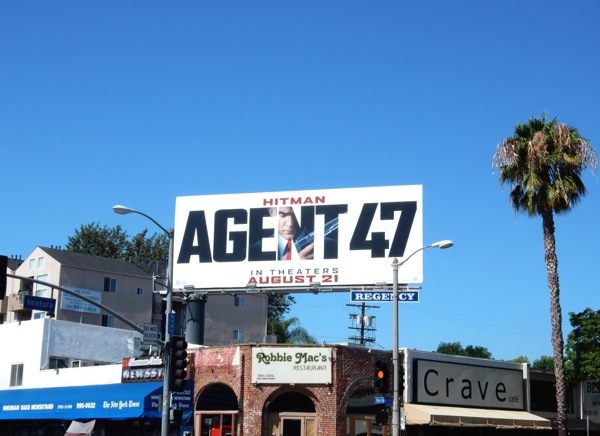 These new ads seem much more generic than the previous versions which were more tailored to living the Hollywood dream. 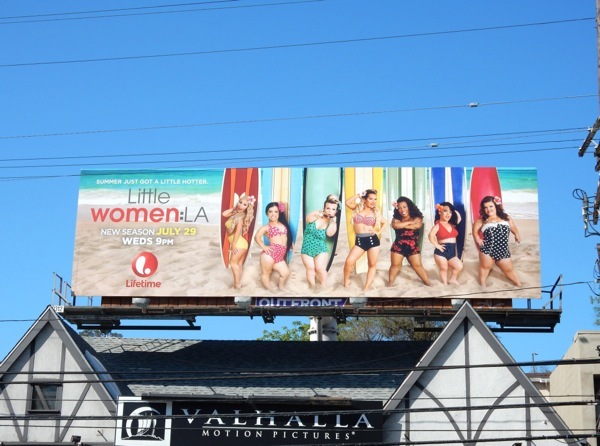 From the looks of things in the skies of L.A. this month, Lifetime's Little Women reality shows are getting a big promotional push. 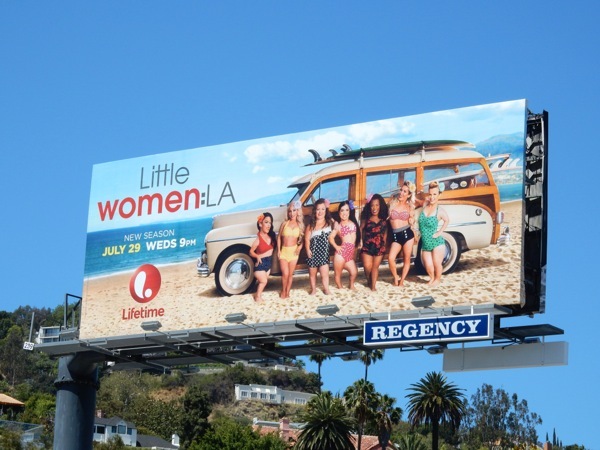 Taking a leaf out of Bravo's Real Housewives, Lifetime's reality series Little Women focuses on a group of close-knit friends dealing with relationships, careers and parenting, all linked by the physical trait that they are little people. 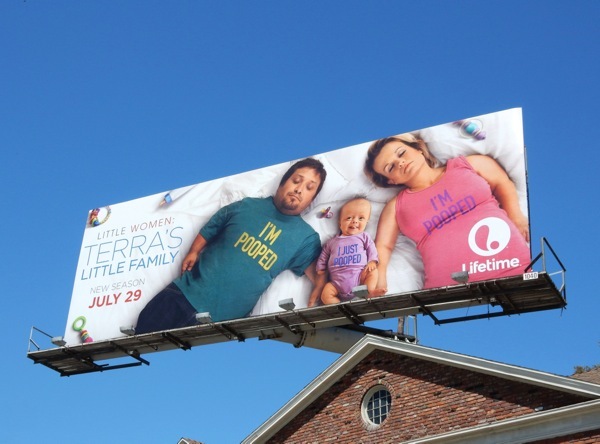 The L.A. ladies even have their own spin-off show, Terra's Little Family, starring actress Terra Jolé and her actor husband Joe Gnoffo and their newborn baby Penny. 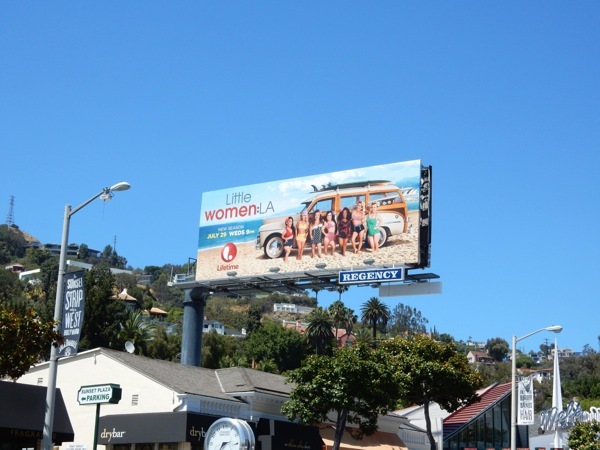 The season three 'Woodie car' beach ad creative was first snapped above West Hollywood's Sunset Plaza on June 24, whilst the colourful 'surfboard' version was photographed at the bottom of Barham Boulevard at Cahuenga Boulevard on July 24, 2015. 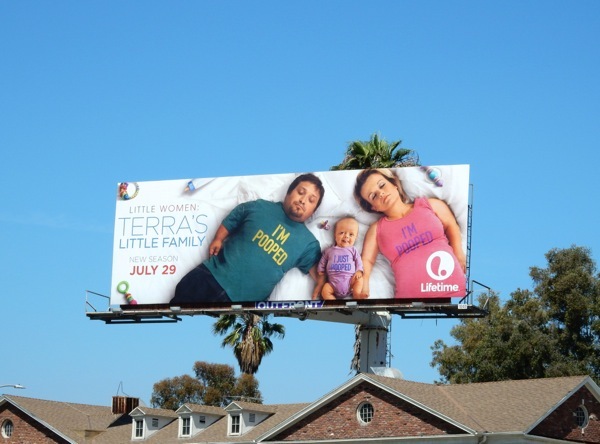 Meanwhile the adorable 'I just pooped' baby billboard for Terra's Little Family was spotted along San Vincente Boulevard on July 10, 2015. 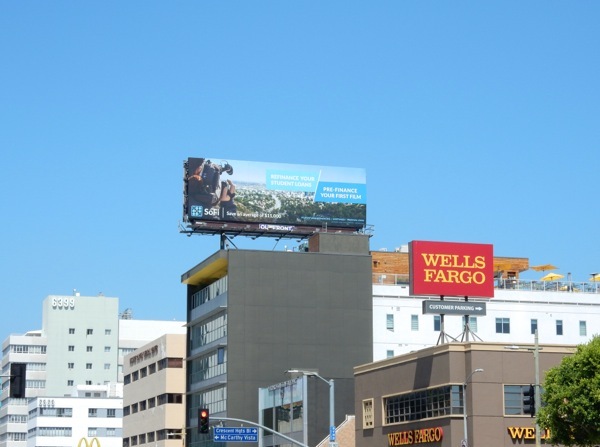 For more cute baby billboards, be sure to also check out these Baby Gap ad campaigns and these Neighbors movie billboards. 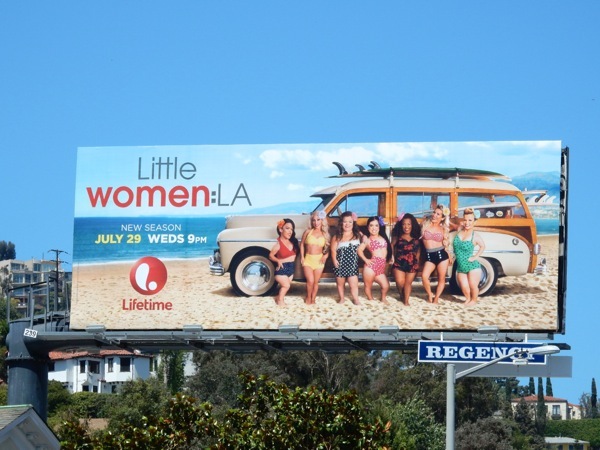 These may be little women living in California, but they certainly look like they have big personalities. 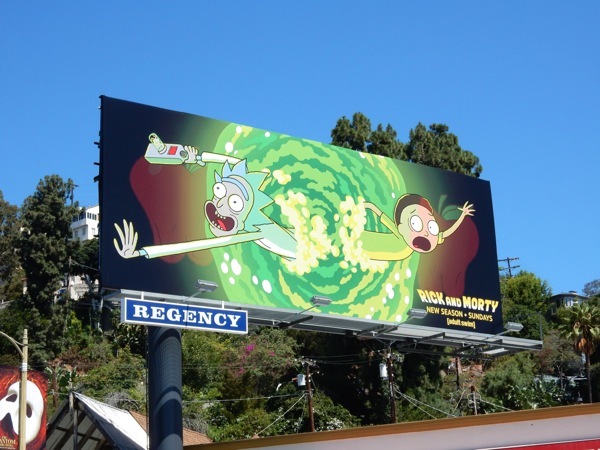 Adult Swim's fan-favourite animated series Rick and Morty returns for its dimension-hopping second season, so get ready for more outrageous misadventures through time and space with the mad scientist and his gullible grandson. Just what alternate worlds and parodies of your favourite science fiction films and genres this twisted homage to Back to the Future's 'Doc Brown' and 'Marty McFly' will encounter this season are yet to be seen, but we're sure the new episodes will leave you hungry for more. 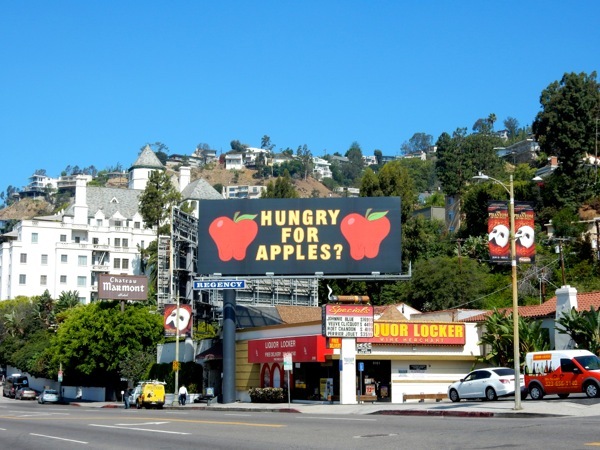 Daily Billboard is sure there'll be more gems, like Morty's father's marketing slogan, 'Hungry for Apples? ', to enjoy this season and even more chaotic happenings to befall their family as the stumble and burp their way through the multiverse. 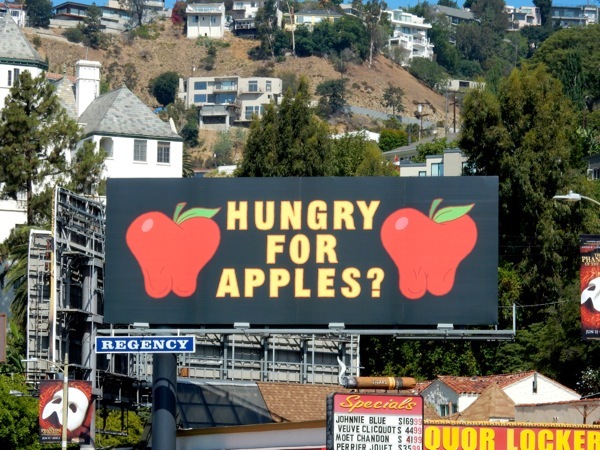 The 'Hungry for Apples?' 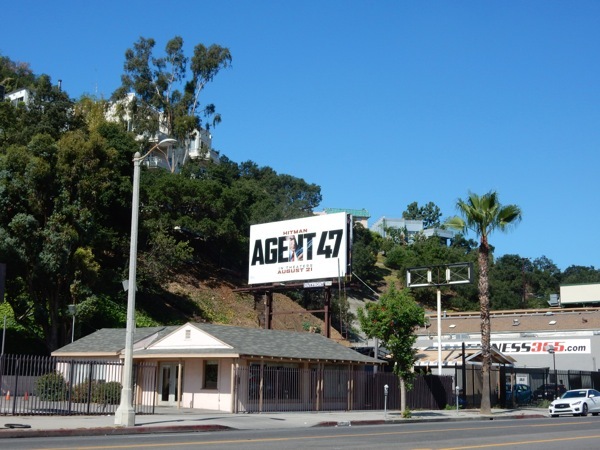 teaser billboard was spied along Sunset Boulevard in West Hollywood on July 14, whilst the second season 'portal' ad creative was snapped in the same ad location on July 25, 2015. 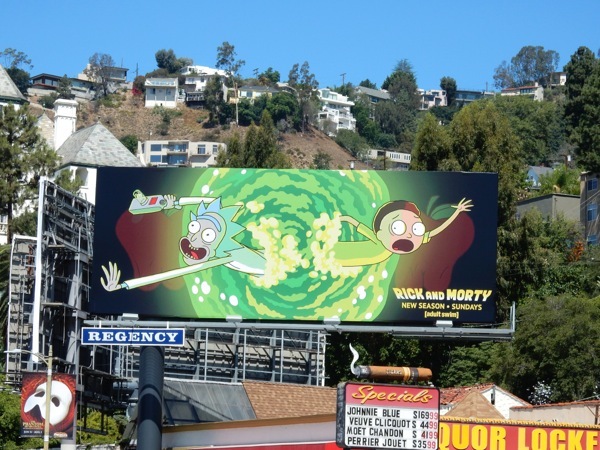 If you're a fan of the satirical sci-fi show and are hungry for more, be sure to also check out this fantastic 3D crashed spacecraft billboard for the first season of Rick and Morty from the end of 2013. 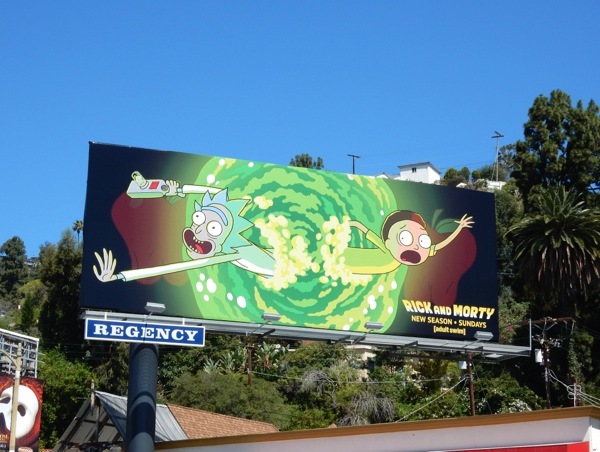 A genius mad inventor and his naive sidekick hopping from universe to universe, what could possibly go wrong? Just watch and see. 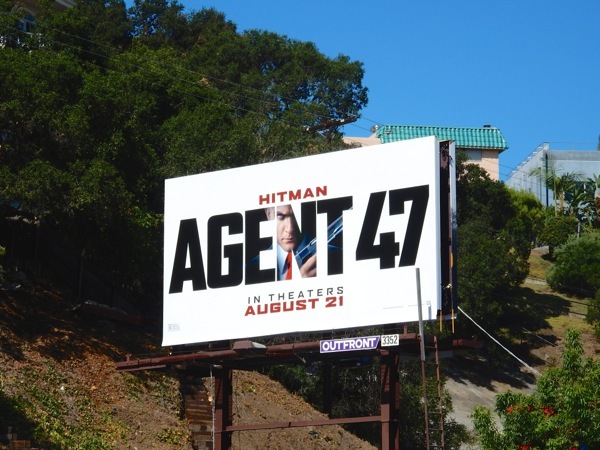 Jurassic World and Terminator Genisys are not the only film franchises rebooting this Summer, as in August you can add Hitman: Agent 47 to the list. 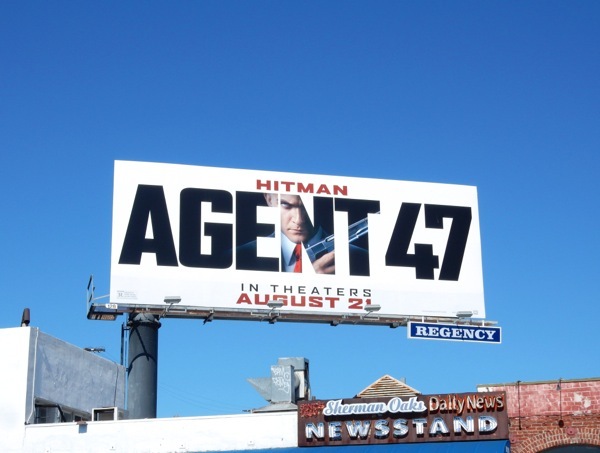 Hitman was originally adapted from his successful console game origins in 2007 with Justified's Timothy Olyphant as 'Agent 47', but now the shaven-headed assassin-for-hire is back with Homeland's Rupert Friend as the deadly protagonist in question. 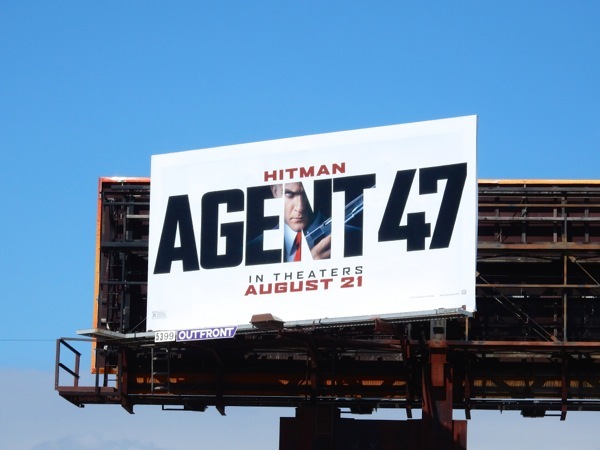 First time director Alexander Bach brings the elite genetically-engineered killer to the big screen, with Star Trek's Zachary Quinto and Hannah Ware also starring. These Agent 47 billboards were snapped along Ventura Boulevard in Sherman Oaks and Studio City, plus along La Brea Avenue from July 21 to July 24, 2015. 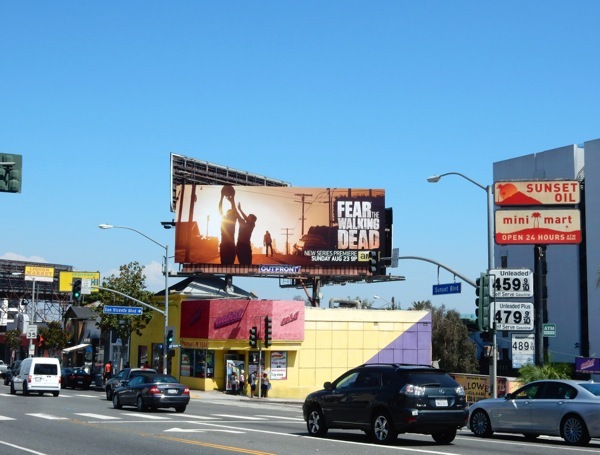 For similar film title treatments in the ad design, be sure to also check out these Taken 3 movie billboards, Epic movie billboards and Salt movie billboards. 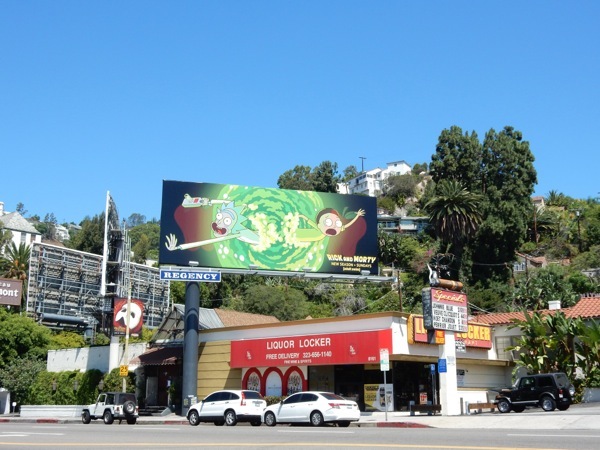 If you're a gamer, you should also check out all these different video game billboards filling L.A.'s skies in recent years. 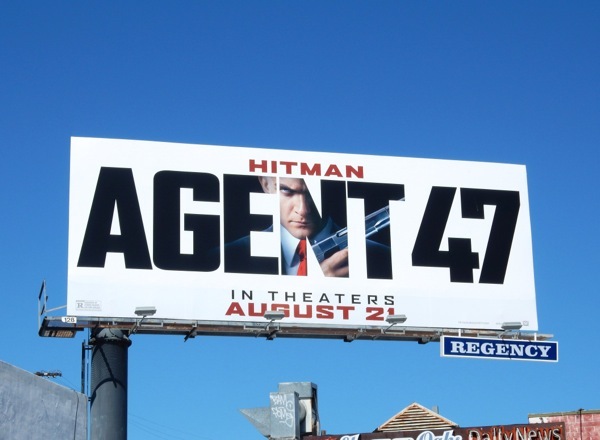 It's safe to say that video game adaptations can be a little hit-or-miss, so let's see if Hitman: Agent 47 can hit the target this Summer. 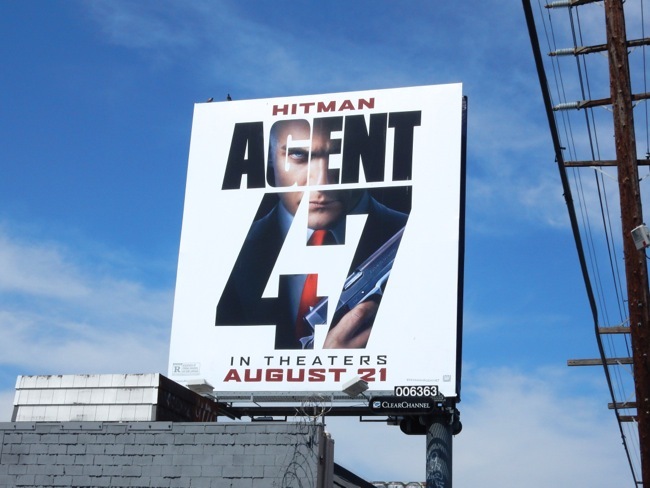 UPDATED: Here's another portrait version of billboard creative, this time placing more emphasis on the number '47' and with the eye placement making the assassin look even more menacing, snapped along Santa Monica Boulevard on August 3, 2015. 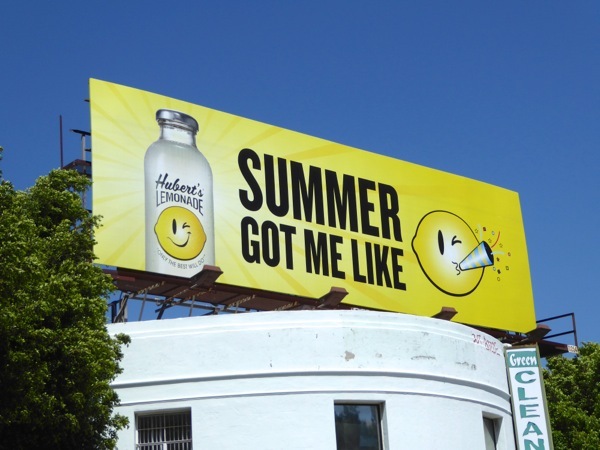 There's just something really refreshing (pun intended) about this Hubert's Lemonade ad. 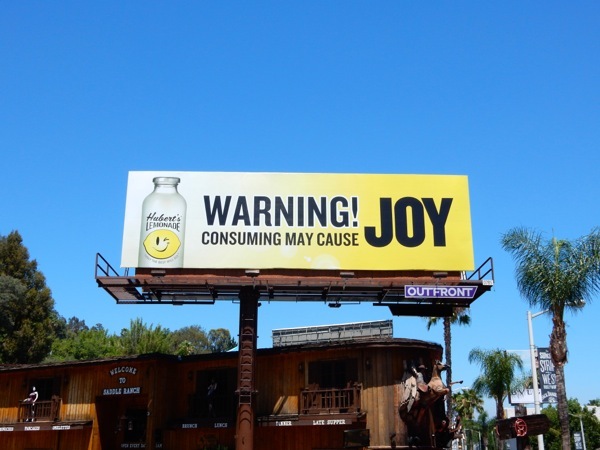 The drinks billboard is so simple, so bright, so joyful - a breath of fresh air (or fresh lemon at least) in the city skyline. 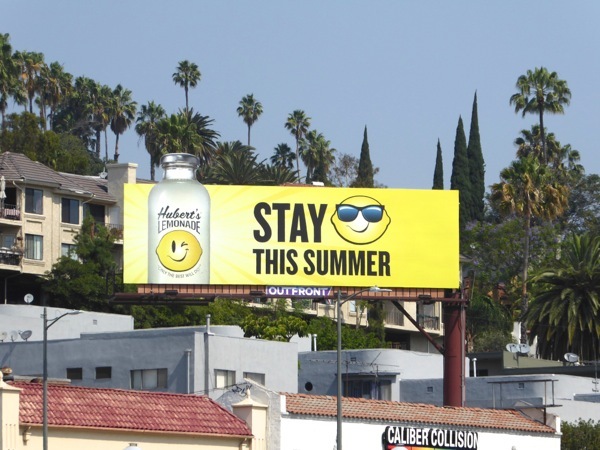 This vibrant and arresting beverage billboard was spied along the busy Sunset Strip in West Hollywood on July 24, 2015. 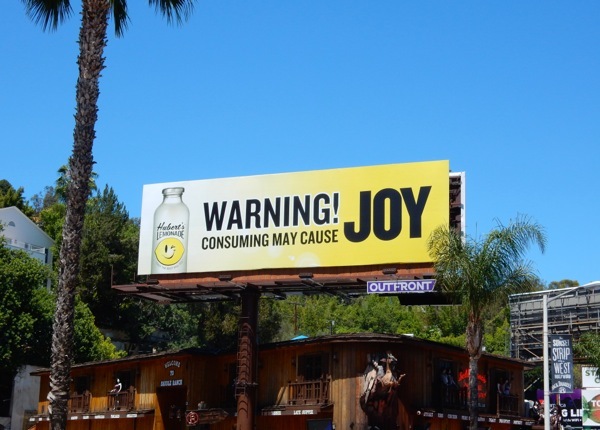 Funnily enough, the character 'Joy' was a big part of Disney/Pixar's latest animated Summer blockbuster, so be sure to also check her out in these fun and joyous Inside Out movie billboards. 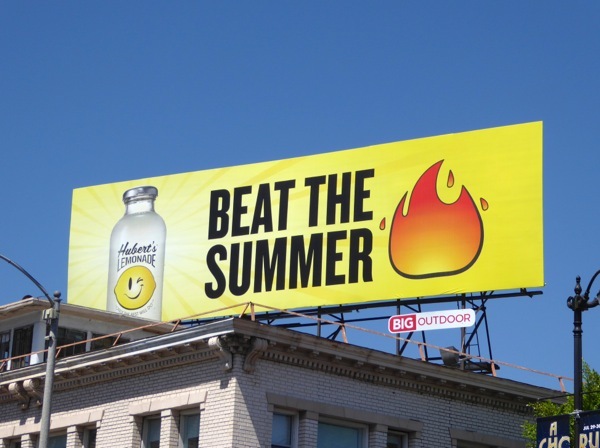 For more ideas on how to market drinks brands, be sure to compare this billboard to all these other drinks and beverage outdoor ad campaigns here at Daily Billboard. 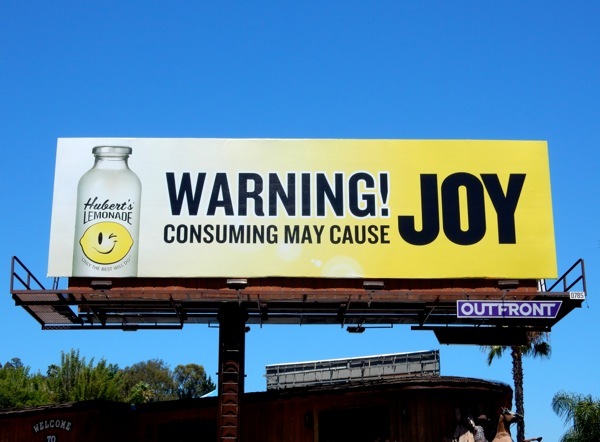 Everyone needs a bit of joy in their life, so when life gives you Hubert's Lemonade, drink it! 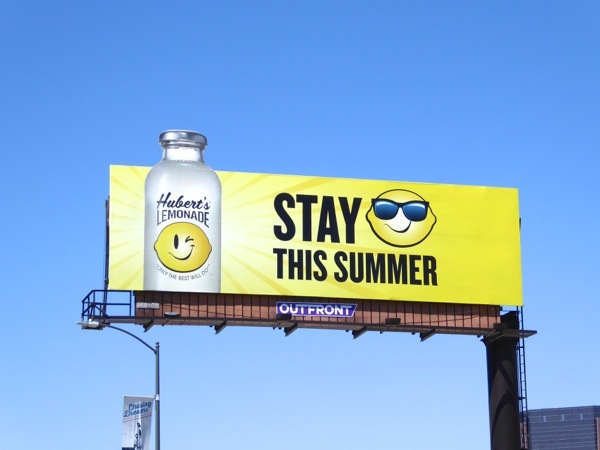 UPDATED: If you liked last year's ad creative for Hubert's Lemonade then you'll also love the 2016 offering. As you can see the billboard shines out from a distance high over Wilshire Boulevard on June 22, 2016, although Daily Billboard was wondering if the intention of sunglasses-wearing lemon in the tagline was 'Stay cool this Summer', or is it 'Stay chilled', or even 'Stay lemon fresh' (which sound more like a toilet cleaner slogan). We'll let you decide. 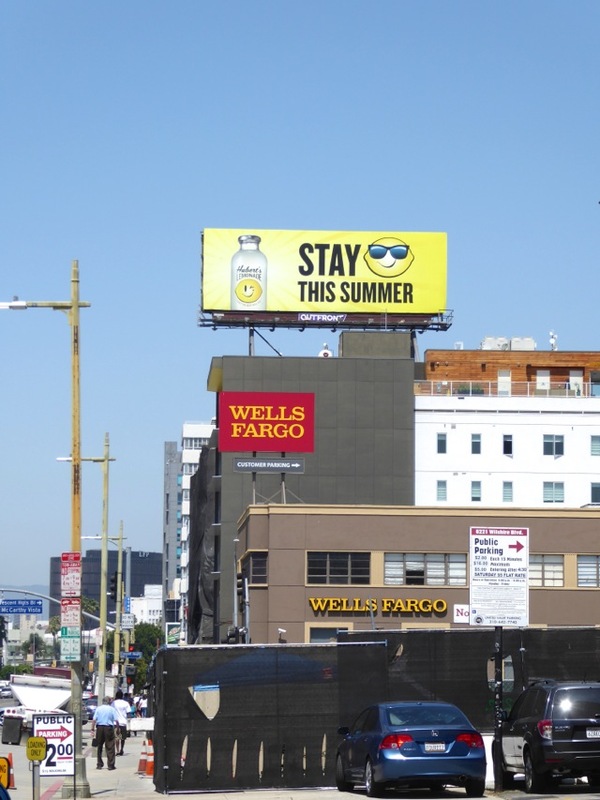 In addition we also spied this special extension version of this ad creative along Cahuenga Boulevard in Hollywood on June 25, 2016. 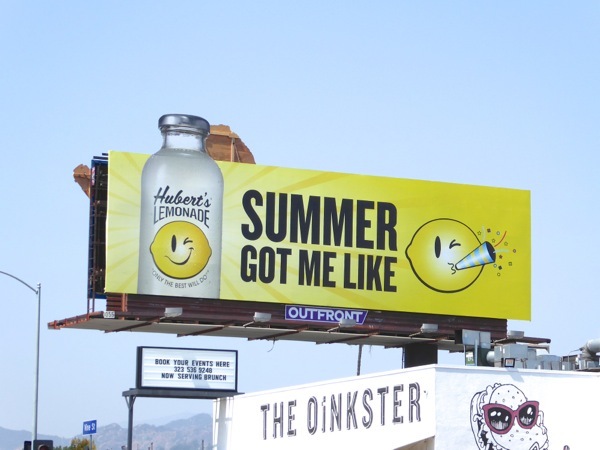 Plus a different 'Summer got me like' cut-out extension billboard with another lemon emoji character was spotted along Vine Street the same day. 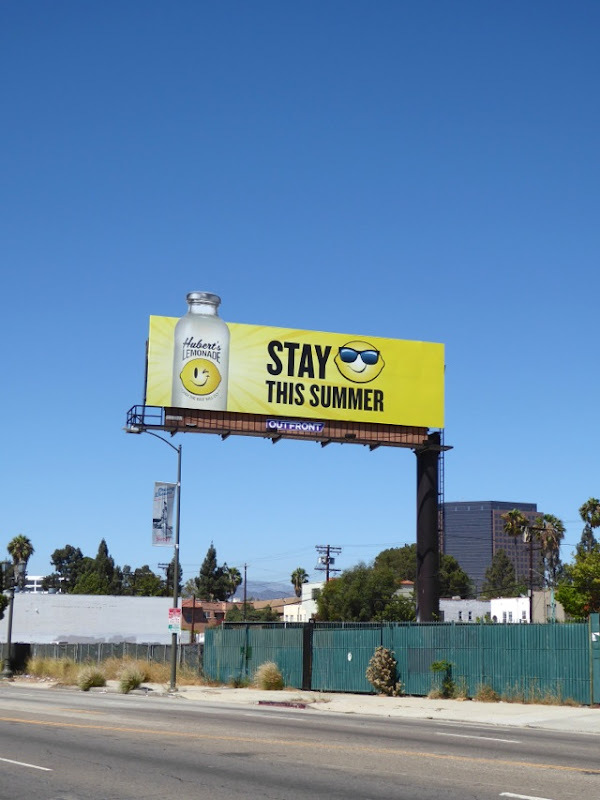 And another zesty standard example photographed along Pico Boulevard on July 7, 2016. 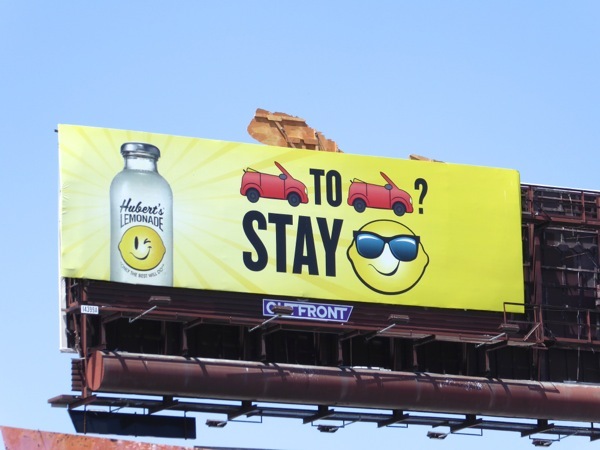 Plus here's a fun 'Bumper to bumper? 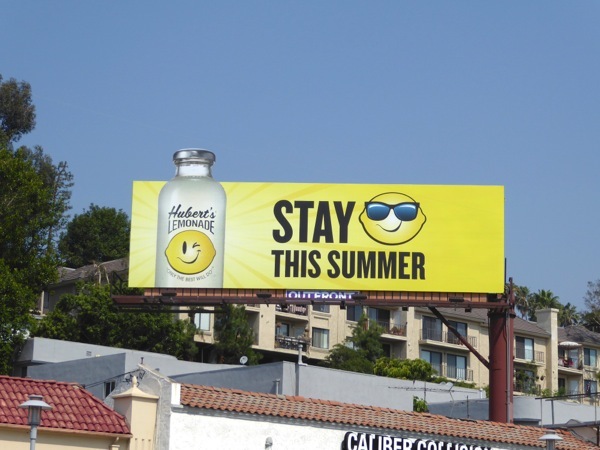 Stay cool' ad creative spied along the heavily trafficked Santa Monica Boulevard on July 12, 2016. 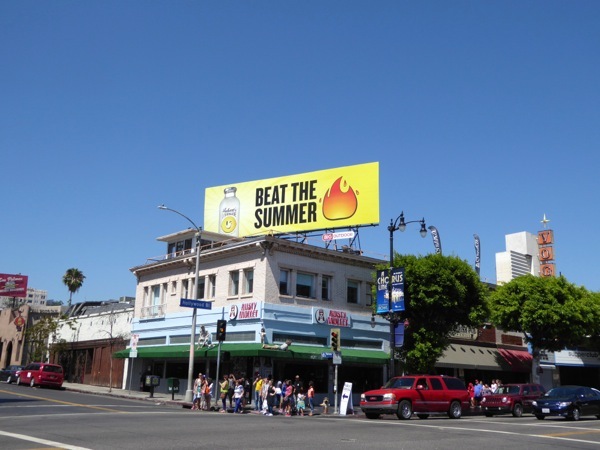 And along Hollywood Boulevard on July 16, 2016, Daily Billboard spotted this other fiery 'Beat the Summer heat' ad creative, which is so appropriate with the soaring Summer Southern California temperatures. 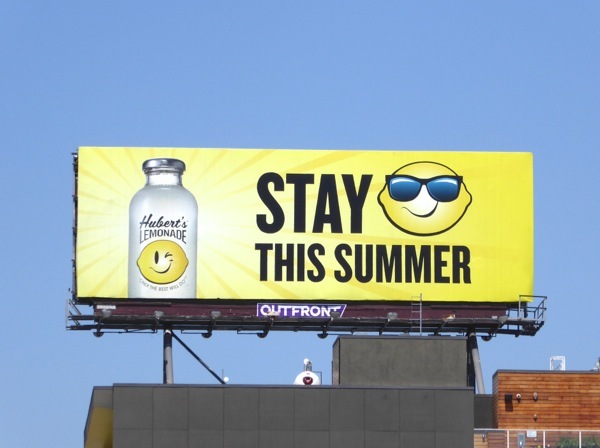 UPDATED: Hubert's Lemonade is certainly owning Summer with these sunny ads refreshing the L.A. skyline. 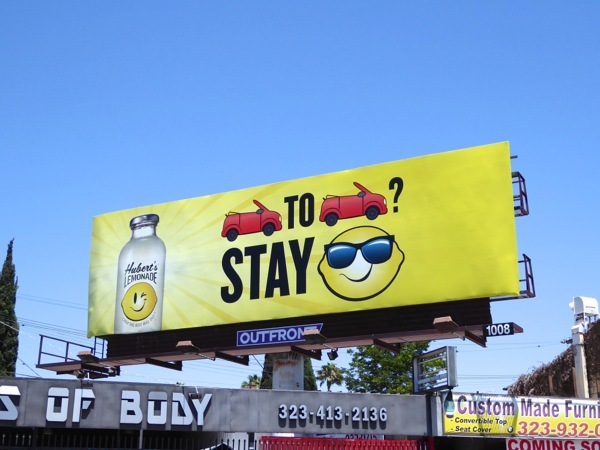 Here are more standard and special extension examples of the vibrant emoji campaign snapped along La Cienega Bouelvard and Melrose Avenue on July 21, 2016.